I was discharged from the pain clinic today. 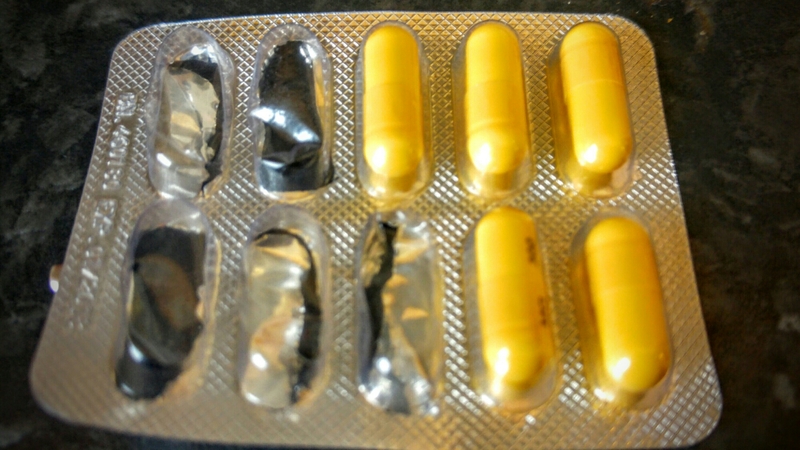 After explaining how my pain has eased a little on Gabapentin, I am still struggling to cope with the pain. Which is also causing me to feel horribly anxious constantly. The Dr prescribed Tramadol instead of Codipar and decided that there’s not much more the Pain Clinic can do for me after he went through the options we had tried. 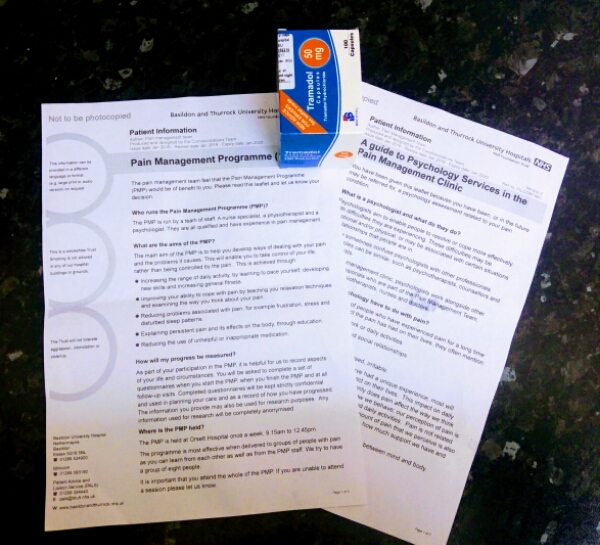 Physiotherapy, Steroid injections, Ten’s machine and the Gabapentin. He decided instead I should have Pain management sessions under the psychology department. These sessions are supposed to help teach me about pain, how to pace myself (we all know that’s a huge issue for me!) and cope better all round. These will be group sessions which I am anxious about.. especially as I mostly see elderly people at the pain clinic. They love to point me out and stare.. I hope there’s a few younger people there! I’m hoping the wait isn’t too long for pain management and CBT. Fingers crossed Tramadol helps improve things as I haven’t been coping well recently. I can’t stop worrying I haven’t done enough or I have too much to do. I constantly feel stressed and struggling to interact even more than normal. Even posting has been an issue, I write then delete. Or I write and it just sits there because I feel my posts are pointless. I am determined not to let this beat me. Going to sessions around everything else is going to be stressful but hopefully worth it in the long run. I have some awesome people who listen to my grumbling and give me encouragement too. Have you tried pain management courses? Or CBT? I’d love to know how other’s have got on. Yesterday was the start of week 5 & I started taking 600mg in the morning along with 300mg at midday and 600mg at night. It definitely helps me move a little easier although I still can’t seem to do as much as I feel able to at times. I’m still feeling awful after 2 lots of 10 minute walks, 1 involving a walk around Aldi too. I thought I’d be fine, I felt great in the morning! But by midday the pain was getting too much again and by bedtime I couldn’t sleep from the pain. On days I don’t go out & I just clean it’s not too bad and much better than before Gabapentin so I know it definitely helps & most nights I am sleeping well as long as I haven’t overdone it during the day. I’m going to attempt booking a Dr’s appointment this week to get Gabapentin added onto my prescription since it has given me more relief than anything else I’m on. Has Gabapentin helped you? Are you trying it too or have you been on it a while? I had pain management today and was quite anxious about going. It didn’t help that I had to go to the Dr’s first where I didn’t get seen until half an hour after my appointment time but the main reason was that I needed to bring up the fact that whilst my First steroid injections for a little while things had gone down hill since. After explaining I’ve been getting electric shock type pains all over, the burning and tingling I’ve had, how everywhere seems to constantly ache especially when I’m cold, my memory has gotten worse and I’m struggling to keep my balance amongst other things The Dr decided the injections weren’t going to be helpful as I had 3 injections at once not just one so it should have helped for a lot longer and instead, I was offered a trial of Gabapentin. I had to think about it quickly.. I don’t want to rely on yet more tablets but I’m struggling so much to cope with the pain. Everyone must be as bored as I am with all my complaining. With the cold weather setting in I’m honestly scared to think I could feel the same as last winter. I decided to give it a go. 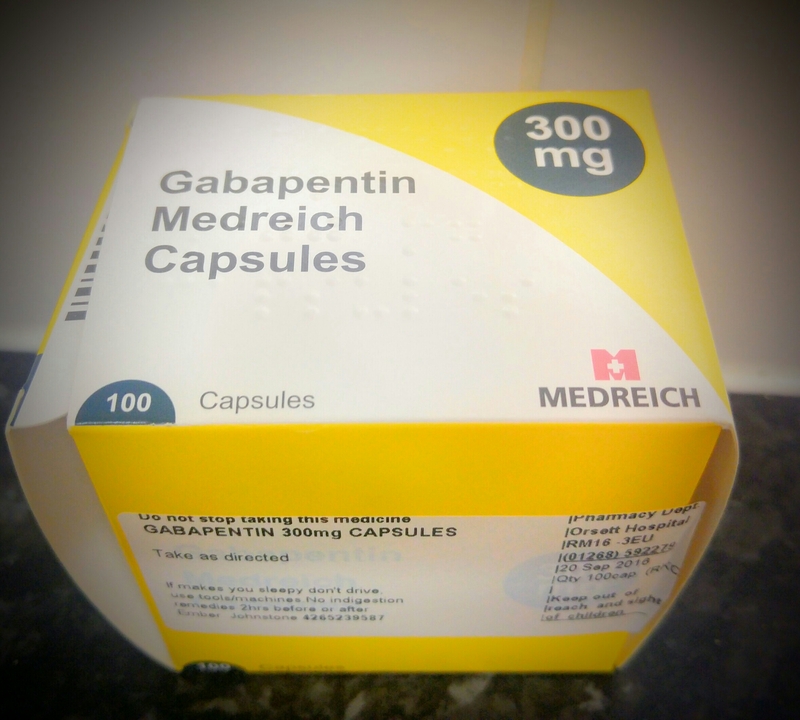 I’ve not really read much about Gabapentin up until now and I still don’t know a lot about it but it sound’s like it’s worth a go so tonight I’ll be taking my first dose of 300mg and gradually up the dose over the next 6 weeks & hopefully it will help. Have you tried Gabapentin for Chronic pain? Did you find it helped much? What dosage are you on or are you trialling it yourself? I’d love to hear from others too and find out how they get on! Yesterday was Eva’s first day back at school and of course before we even got to the morning there was a problem. A rather bloody problem! Eva managed to slide down her plastic steps scraping her foot leaving a long flap of skin hanging off which we had to cut off Sunday night. We told teachers about her foot the following morning as she wanted to go in, she soldiered on through the day but by the time she got home it obviously needed airing so we will see how she goes over night, she may have to stay home tomorrow to keep it aired. Apart from Eva’s foot the day started off great! The Mr & I woke well before the alarm and managed a cup of tea before waking the girls. Eva’s written morning routine helped keep her on track and she was actually ready well before she needed to be. Eva struggles to stay focused when getting ready and normally needs constant reminding, this morning I was really impressed with how quickly she got ready, maybe it was the excitement of her first day back at school but hopefully she keeps it up. The Mr took Eva off to school & Izzy stayed with me as it was raining but as I let her have the TV on she was ecstatic and let me get the kitchen cleaned in peace. By 9.10am my kitchen was done & although my hip was aching I felt like I could do a bit more so started on the girls room. I managed to get it looking tidy after 7 whole weeks! I felt like crying by the end of it but the Mr took Izzy shopping, so I put away the washing and curled up in bed for half an hour to rest. Not long after they returned my brother arrived quite stressed and tired after struggling to sleep for days so we got chatting and cheered each other up a bit. I decided to pick Eva up from school as I felt awful that I missed taking her in the morning & do it so rarely now. My brother decided to come with me when I mentioned I’d take Izzy. Before we even left he took over Izzy’s trike & wouldn’t let me push it as he knows it really hurts my back & I struggle with the walk. It was lovely to see him thinking about me and enjoying pushing Izzy. They really had a laugh once he got the hand of the handle, weaving along the paths and zooming ahead and we joked with a group of women about Alex needing learner plates as it was his first time. Once we got to the school I found Eva’s new classroom had been moved again. We had to ask for directions to find her and as soon as she heard my voice and saw my brother she came running out shouting ‘Uncle Alex!’. She was so happy and surprised we were both picking her up. Unfortunately as I looked up from Eva I suddenly felt extremely overwhelmed by the amount of people surrounding us and began to panic. Alex spotted it straight away and asked what I needed so I told him to just get us out of the gates so he charged through the crowd with trike clearing a path for me to follow. Once we were out of the gates I was fine and felt a bit silly, especially as its normally me calming my brother down, not the other way round. We got walking and suddenly I looked up and saw Alex running off full speed to the end of the road giggling his head off with Izzy. When we finally caught up with them they were still laughing & my brother said ‘Sorry about that Izzy told me to run, so I did’. I cracked up. My brother is normally VERY careful with the girls and scared he will do something wrong or hurt them so I was really proud he just went for it & trusted himself enough to do so, his confidence with the girls really is coming on leaps & bounds! On the way home I began to struggle with the walk and asked them to walk on as I find it awkward slowing everyone down. By the time we got home and checked Eva’s foot the skin had gone white where it had been covered and damp all day so we left it uncovered to air out over night to see how she got on, she ended up staying home today as although it is healing and looks better the skins tightening & scabbing making it harder for Eva to walk and very uncomfortable for her, sofa day it is! I really do enjoy watching these 3 play together and love that they now see their Uncle weekly and spend time playing & doing things. It’s hard sometimes not having much family around for them so it’s lovely they have at least one blood relative they are really close to & where I struggled across the day it was nice to have some extra help. I also really appreciate just how much Alex helped me yesterday especially as I really had over done it with cleaning & then went on to do the school run making things worse & the panic attack on top. Oh and yes I HURT today! It wouldn’t be a Monday morning or the first day back at school without a few hiccups though aye? As I climbed into bed last night I just suddenly hear Izzy shout ‘RUN!’ in my head and picture them speeding ahead and cracked up.I ended up texting my brother before falling asleep to thank him for his help, his Asperger’s can make it so difficult for him to know what to do in most situations and I was so proud and grateful he had managed to do so well and help so much across the day! If your little ones gone back to school how did the first day go? Do you ever have panic attacks in the school playground? How do you deal with them? I’ve barely blogged, barely Tweeted and even my Instagram has been much quieter over the last few weeks as thing’s have been quite up & down and I really haven’t felt great at all. On a good note I received a nice little back pay a few weeks ago as I was entitled to the ESA support rate backdated to the 13th week of my claim, I was aware they do this but didn’t realise how long I had waited so it was a lovely surprise and arrived in time for me to be able to treat the Mr properly on his birthday for pretty much the first time in the 10 years I’ve known him! I gave him money to spend at the Thurrock Beer festival which he attends every year since its around his birthday and he loves real ales. He came back happily carrying TWO! of these bottles (admittedly one was cider for me :P) & a glass. The Mr happily came back from the beer fest with this! We also ordered him some new trainers from ebay which turned up with paint and marks all over & didn’t appear genuine, after waiting for our refund & the Mr still struggling to find a pair he liked we decided to order him a pair of Nike ID’s which are custom made how you want! He has to wait anywhere up to the 8th august for them but it stops him settling on a pair and not being happy especially as he does so much running around doing school runs & shopping where I cant. We ordered them last thursday and already recieved an email yesterday (6 days after ordering) telling us the finishing touches are being done before they are shipped! So hopefully we wont have to wait too long. After giving up on our desperate backpack search we gave in and bought him a new backpack too (which I’ll review at a later date) since he does all the shopping and carries it all home from town. I spoilt the girls a little with some new clothes & shoes..which may have led to a new wardrobe to fit them in.. Admittedly they did genuinely need a wardrobe and the clothes & shoes so it was another issue sorted for us! I treated my brother to a few lunches & little bits whilst out shopping including some yummy pancakes & a chocolate milkshake at Roadhouse in Basildon! They were so good but so filling that we both took the rest home for later! 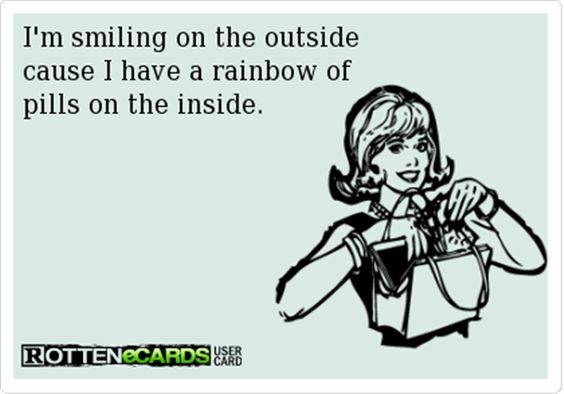 I also treated myself to a new bag, purse and a few clothes aswell as doing things like having my eyebrows threaded over the last few weeks and the Mr dyed my hair purple on Sunday too which has made me feel much more human! Izzy approved of the new handbag & tried to steal it! It’s been lovely being able to do those things as we’ve been struggling to buy things like clothes and pay bills on time so it has been a lot less stressful financially. The kitchen toilet & bathroom didn’t get finished off properly but the Mr has somehow managed to fit in repainting the toilet purple & glossing the wood as the way it was left made it feel extremely claustrophobic! He’s purpling the bathroom & kitchen next too! Although I have been really down lately I am thankful there’s been a lot of positive going on for me to focus on too and Izzy has been going almost everywhere with the Mr lately give me a lot of time to rest & focus on myself doing silly things like actually straightening my hair, having a bath in total peace, taking a nap etc which has really helped my mood the last few days. I have a lot of catching up to do with the blog and saying hi to people again but I’m hoping to slowly catch up over the next few weeks, feel free to say hi and send me your latest posts to help me catch up! I can finally breath a huge sigh of relief! The last few weeks have been so damn stressful it’s unreal! I’ve been stressing about my ESA assessment decision almost constantly, we had to make such a tough decision and re home the cat’s knowing whatever the outcome we just can’t afford the extra cost’s any more, we’ve had several problems with the refit the council are doing and 2 kids at home with it all going on this half term (which of course has been miserable!) has just been utter chaos! Getting a call yesterday morning from a number I didn’t know freaked me out and I almost rejected but I am so glad I didn’t! It turned out to be the person finalising my ESA decision which initially made me panic even more as I was convinced I would be refused but I spoke to such a lovely lady and after a chat and adding on a little more information about the side affects I’m having from my medication she made the decision to award me ESA for the next year! Honestly I was gob smacked I’ve heard so many depressing stories and anything that involves the job centre has always gone badly for us so to finally be taken seriously and have all that stress lifted had me almost in tears with relief as I thanked the lady on the phone. When she explained I had originally only been given 6 points based on my anxiety and I would have been refused as I needed 15 to pass I nearly passed out but after explaining the nasty side affects of my medication to her and how things have worsened in general she had decided to award me full points! 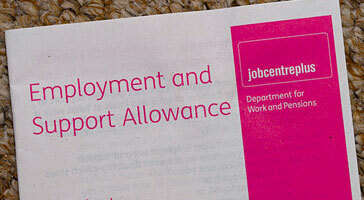 My assessment was based on my chronic pain which without the medication side affects they see me as fit for work. My depression was basically ignored because I told them that although I have attempted suicide a few times in the past, knowing I have a family now I wouldn’t be able to bring myself to attempt it again knowing the emotional and financial impact it would have on them. My anxiety was at least considered severe enough to be awarded some points but looking at the overall picture it’s horrible to think how many people in a similar or even a worse situation would be refused and deemed fit for work! I know I am extremely lucky to be given this break and I appreciate it so much being able to just focus on my health and my family for the next year and I’m hoping in this year I learn to manage everything better so one of us can go back to work and we can start saving and getting somewhere at last! On the 22nd I have my ESA assessment and I have to say it’s really making me nervous. It’s so hard trying to explain to people how much I struggle on a daily basis with both my pain and mental health and I’m terrified as if I’m refused I just don’t know how we are going to cope. I tried to write on a ‘support’ group how I am feeling and was surprised to find so many people making horrible comments towards me, I know there are people a lot worse off than myself and I can appreciate it is so much harder for them but to me this is difficult too and I need to ramble about it somewhere safely… I guess this is kinda what the blog is for after all! I didn’t expect to get as far as actually going through with the assessment, I guess part of me hoped the steroid injections would have helped ease enough pain for me to start getting back on track and start looking for a part time job but after a good week everything has just gone back downhill and I’m back to where I was before the injections so I have no choice but to go through with the assessment and hope for the best but my anxiety is getting the better of me and feels like it’s eating me up. How do you even begin to explain to a total stranger that although you look fine on the outside apart from walking a little funny that every step requires so much effort that even a 5 minute walk leaves you exhausted physically and mentally at the age of 25? 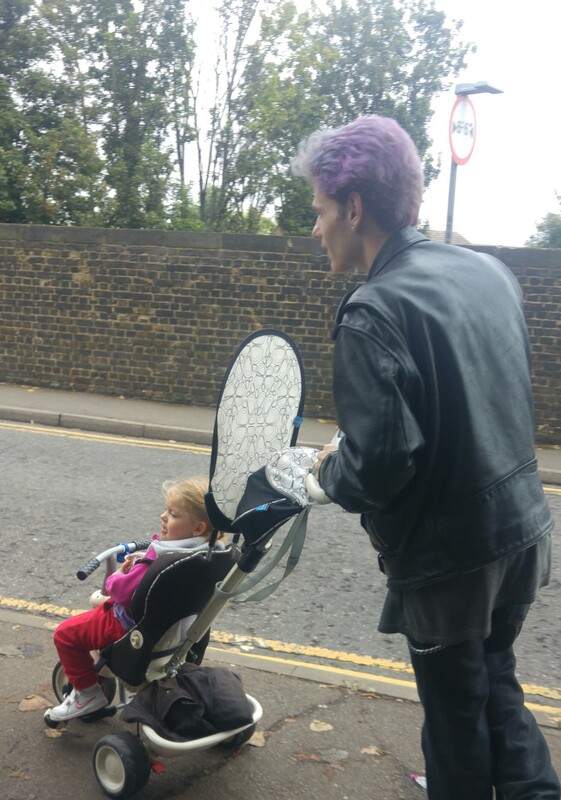 I know being completely honest is necessary but it’s also scary to think I’m going to have to admit to a stranger that I can’t pick up my baby at just 20 month’s old, if I take her out on my own I have to get the Mr to put her in her stroller as I can’t even do that without causing more pain, I cant even lift her onto a changing table so have to lay her stroller flat if I’m alone! How do you admit that you can’t even manage walking your 5 year old the 10-15 minute walk to school and back every day and have to rely on the Mr to do it otherwise I’m left in so much pain and feel so drained that I’m left completely useless for the rest of the day? I guess a big part of it is me feeling like I am admitting I am a failure as a mother, I cant lift and rock my baby when she needs it, I cant walk my daughter to and from school and get chatting with the other mums, I cant take the girls to the park regularly, I cant bend down and pick up their toys properly, hell I cant even wash their damn clothes because the bending, lifting, and stretching to hang the clothes sends my back into spasm! How do you admit all this to a stranger face to face? How do you explain that your basically useless and break down several times a day just trying to do the most basic of things? How do you explain that simple tasks make you feel so queasy because of the pain & a sharp bolt can make you vomit & leave you feeling so shaky and weak without sounding like a drama queen? I’m also terrified my emotions will get the better of me on the day, I’m an emotional wreck most day’s as it is and if I get too worked up I get queasy and struggle to breath without throwing up! Any time I try to explain to someone what I’m going through it makes me feel like crap reeling off a list of basic tasks I struggle to do, how every time I struggle I become so upset and angry with myself for not being able to do such a ‘simple’ task etc. It all just sounds like I’m over reacting! I guess I’ve tried to hide the pain and how it leaves me feeling from people for so long that now I need to open up and be honest so I can get the help I need it’s much harder and it feels like I’m about to go to confession to admit all my failures instead of sins. It’s terrifying to think they could decide to deem me fit to work when I can’t even load the dishwasher daily, climb into the bath, push a hoover around and all the other thing’s most people do without thinking. The worst part is if they do say I am fit to work I have no choice but to try and find a job as there’s no way I could cope trying to keep on top of school runs, looking after Izzy etc so I need the Mr to be at home to carry on doing it all as I can’t. Then there’s the added fear of how my health will affect a job as just 5 weeks doing 4 hours a day work experience at the job centre was draining and one of the day’s I had to be sent home as I was in so much pain & everything felt too much and I arrived in tears! I tried so hard for the first week or two to hide it but eventually the staff I worked closely with were picking up on it and I was made to go sit at a desk several times. One of those times I was struggling so much I buried my head in my arms on the desk to hide the tears whilst I tried to stretch my back out that one of the managers walked past and thought I was being lazy and told me to sit up which of course led to me feeling even worse and having to excuse myself to go hide in the toilet for 5 minutes to calm down. I’d love to work, I’d love the chance to socialise with other’s and actually make some friends around here and do something to be proud of and show the girls the importance of working but I know realistically I just wouldn’t cope,I cant even keep on top of the blog on bad days because I just can’t even focus! It’s fairly easy to get this all down in words but how on earth am I meant to explain all this to a complete stranger and have them take me seriously? So many questions and I know on the day I’ll only feel worse and again afterwards waiting on their decision. I guess time will tell but I needed to get it all off my chest instead of letting it carry on eating me up!